We are currently collecting Box Tops from cereal packets for next year. These will be "swapped" for books for our Library. The scheme runs until March , so please keep collecting and sending in any Box Tops that you have. Thank you for all the vouchers this year. Each year group had 2,000 vouchers to "spend" on whatever they needed. We have sent off an order for things ranging from Literacy resources and art resources to interactive CD ROMs. We are all looking forward to the arrival of the equipment in September. At the end of last term, we sent off our tokens to"swap" them for equipment for our garden. Thank you to everyone who collected tokens for us. 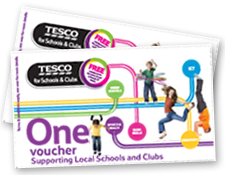 We have now started to collect the vouchers . We will be able to exchange them for a range of equipment for sports,cooking and gardening. If you have any, please send them into school as soon as possible.